Even using the most advanced Q-Clear laser for treating fungus toenails it still takes at least 6 to 8 months for a toenail to grow in normally. What can you do if you want to do a laser treatment for your toenails now and have them looking good in sandals without waiting six months? The answer to having normal looking healthy toenails right away is to combine the Keryflex nail with the laser treatment of your toenails! The Keryflex nail is an artificial nail which is bonded to your natural nail in a multi-step process which is very different from acrylic nails. It is a patented procedure which is available only in podiatry offices that have been trained in the procedure. The nail can be polished and provides a normal looking, smooth toenail which will move with your toe and feel perfectly normal. 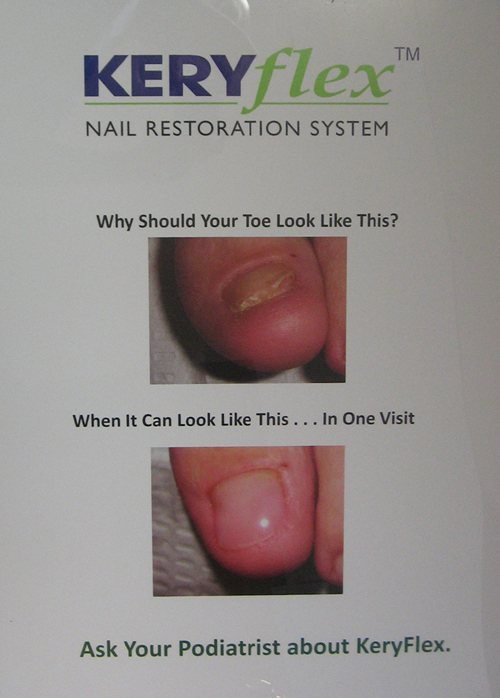 The Keryflex nail helps to seal the toenail after the laser has killed the fungus in the nail. This prevents re-infection of the toenail and helps your nail to grow back smooth and well attached to the nail bed. We have been using the Keryflex nail procedure with laser toenail procedures for the past six months and to our knowledge are the only podiatry practice in Austin providing this service. More information about the Keryflex nail is available at our office and on our website. And don’t forget, at our office, we also stock a full selection of “Dr.’s REMEDY®” nail polish which has natural anti-fungals including tea tree oil and vitamin C and does not have toluene, DBP, and formaldehyde which damage the toenail. So it is not too late to have normal appearing toenails ready for sandals and barefoot summer activities! Next Post Next post: Lipstick on a Piggy?? ?